His Highness Sheikh Mohamed bin Zayed Al Nahyan, Crown Prince of Abu Dhabi and Deputy Supreme Commander of the UAE Armed Forces, on Monday received visiting Chadian President Idriss Deby. The two leaders discussed ways of bolstering cooperation between the UAE and Chad to serve the common interests of the two countries, with a focus on economic, trade, investment, development and energy spheres. They discussed all aspects and opportunities of serving the interests of their countries, including benefiting from their expertise and successful experiences and the potential for forging economic partnerships, joint development programs and vital projects. The leaders also discussed regional and international developments and issues of common interest for their countries. Sheikh Mohamed welcomed President Deby and wished for success for his visit to the UAE. He stressed that the UAE, led by the President His Highness Sheikh Khalifa bin Zayed Al Nahyan, takes keen interest in stronger relations with Chad in various spheres and in intensified dialogue to advance the relations to higher levels of cooperation and joint action. The Crown Prince also wished for further success, progress, development and stability for Chad. The Chadian President expressed his delight at visiting the UAE. He wished for further growth and progress for relations between the two countries. He stressed that Chad is interested in benefiting from the UAE's experience in development. Sheikh Mansour bin Zayed Al Nahyan, Deputy Prime Minister and Minister of Presidential Affairs; Ali bin Hammad Al Shamsi, Deputy Secretary-General of the Supreme Council for National Security; Mohammed Mubarak Al Mazrouei, Undersecretary at the Court of Abu Dhabi Crown Prince; Lt. General Lt. General Juma Ahmed Al Bowardi Al Falasi, Adviser to Deputy Supreme Commander of the Armed Force, and members of the delegation accompanying the Chadian president. His Highness Sheikh Mohamed bin Zayed Al Nahyan, Crown Prince of Abu Dhabi and Deputy Supreme Commander of the Armed Forces, expressed his pride at Emiratis who pursue excellence and creativity to score achievements in many areas that enhance the status of the UAE regionally and globally, and raise its flag in various fields. He said this as he received the UAE Armed Forces' team members who climbed the Mount Everest - which is 8, 848 metres above sea level. 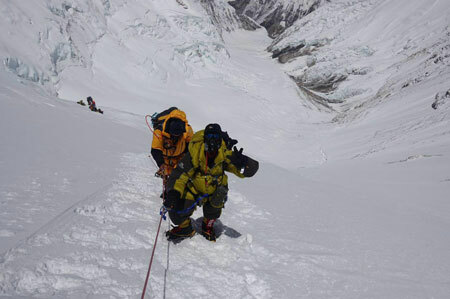 Sheikh Mohamed praised the military team’s feat to climb the Everest, saying their success is deemed one of the most difficult and dangerous tasks. The Crown Prince of Abu Dhabi lauded the spirit of co-operation, teamwork, and determination demonstrated by the team to overcome the difficulties to climb to the highest peak on earth. "I feel proud about the Emirati sons and daughters, who are also children of Zayed. They climbed the world's highest mountain peak," he added. While congratulating them, Sheikh Mohamed said, "We were aware the task was difficult. 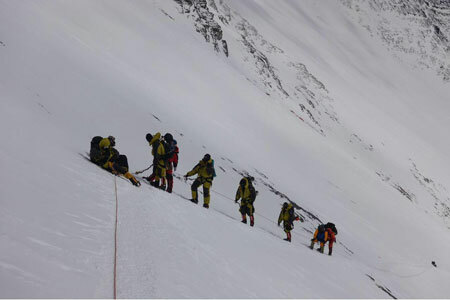 Many of us in the UAE watched the team members while they were climbing the Everest. The risk was high and we were stricken with fear but awed with your resolve to continue the mission." Sheikh Mohamed described them as heroes and role models for Emirati youth, adding that success of each Emirati in his/her field is the secret behind the UAE's prosperity and ranking in the first positions in different fields. The team members thanked Sheikh Mohamed for his full support, which effectively motivated them to accomplish the mission. They added that their feat put a smile on the faces of Emiratis. At the palace, a group of students from Abu Dhabi schools greeted the military team, and expressed joy over the reunion with the Emirati champions. The students showered the team members with flowers for their unprecedented achievement. The team members reciprocated by giving them special photos about the adventure. The reception was attended by Sheikh Tahnoun bin Mohammed Al Nahyan, Ruler's Representative in the Eastern Region; Sheikh Surour bin Mohammed Al Nahyan; Sheikh Nahyan bin Zayed Al Nahyan, Chairman of the Board of Trustees of Zayed bin Sultan Al Nahyan Charitable and Humanitarian Foundation; Lt. General Sheikh Saif bin Zayed Al Nahyan, Deputy Prime Minister and Minister of Interior; Sheikh Nahyan bin Mubarak Al Nahyan, Minister of the Culture and Knowledge Development, and a number of Sheikhs and senior officials and a group of citizens. His Highness Sheikh Mohamed bin Zayed Al Nahyan, Crown Prince of Abu Dhabi and Deputy Supreme Commander of the UAE Armed Forces, on Monday received Ilho Yoo, Deputy Prime Minister and Minister of Strategy and Finance of the Republic of Korea, at Al Bahr Palace. Sheikh Mohamed and Yoo discussed bilateral relations and ways to enhance them in light of strong strategic ties. They also reviewed co-operation in the economic, financial and investment sectors in the light of the two countries' keenness on expanding co-operation in those sectors, and strengthening friendship between the two countries. The two sides exchanged views on issues of mutual concern. Among those who attended the meeting were Sheikh Tahnoun bin Mohammed Al Nahyan, Abu Dhabi Ruler’s Representative in the Eastern Region; Sheikh Surour bin Mohammed Al Nahyan; Sheikh Nahyan bin Zayed Al Nahyan, Chairman of the Board of Trustees of the Zayed bin Sultan Al Nahyan Charitable and Humanitarian Foundation; Lt. General Sheikh Saif bin Zayed Al Nahyan, Deputy Prime Minister and Minister of the Interior; Sheikh Nahyan bin Mubarak Al Nahyan, Minister of Culture and Knowledge Development, a number of Sheikhs and senior officials.